In our last post of 2015, Becky Taylor ponders charity, public sympathy and ‘deserving’ refugees. Merry Christmas! How fickle we are. Back in September the drowning of three-year old Aylan Kurdi made even The Mail take a step back from its habitual anti-immigration vitriol and consider the human costs of the ongoing refugee crisis. Then it appeared that perhaps we were on the cusp of a more compassionate response to those displaced by war and civil chaos. How long ago that now seems. After the attacks on Paris, the vote allowing RAF bombing of Syria and Donald Trump leading the charge of hysterical kneejerk rhetoric tying Syrian refugees to IS, we are back on more familiar territory; a territory where refugees are vilified, mistrusted and left to take their chances with human traffickers, byzantine asylum systems or the ever growing shanty towns on what is effectively Britain’s border, in Calais. Often lost in the swirl of emotive commentary is the simple fact that under international law those fleeing the complex conflicts of the Middle East are refugees, and as refugees have certain rights above and beyond how the public opinion might be being swayed on any given day. Jessica Reinisch rightly suggested in her Europe in Crisis blog piece that the current refugee crisis is complex and refuses easy parallels such as the one I had constructed in relation to the 1956 Hungarian refugees. In it I had argued that this historical moment saw an unprecedented coming together of public empathy with international action. In reflecting on this I proposed that we might use 1956 as an example to remind ourselves that mechanisms could be put in place to solve crises where there was the political will to do so. In my defence I would say that this article stems from a sustained and more nuanced piece of research exploring the British response to refugees across the twentieth century. The arrival of Hungarians after they fled the Soviet invasion is in fact both part of a longer story of ambivalent reception of refugees to Britain, and in itself encapsulated much of that ambivalence. When I wrote of the welcome given to Hungarian refugees entering Britain what I did not do, in that first piece, was to write of the next phase of that history. I had hoped it would not be necessary. Even academic historians sometimes give way to hope. Now seems an appropriate moment to move beyond hope and explore what happened when 21,000 Hungarian refugees arrived in Britain in a matter of weeks over the winter of 1956/7. As with the Syrians currently arriving in Canada, behind the novelty of the reception programme and welcoming words lurked attitudes with a far longer history: a history of charity engrained with expectations over proper expressions of gratitude and the behaviour of the deserving poor. 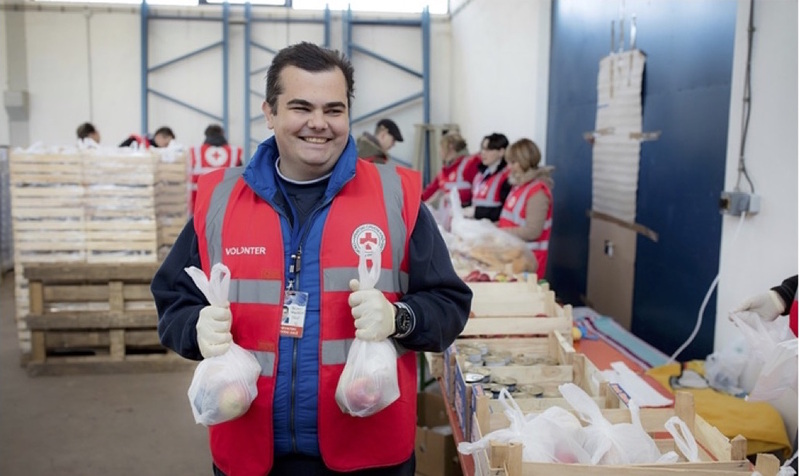 Bruno Grgurević, one of the Red Cross volunteers arranging for food packs to be distributed to arriving refugees at the Slavonski Brod temporary transit centre. Photograph: David Levene for the Guardian. Reading contemporary newspaper reports what is immediately striking is how the refugees were portrayed. For, although the international effort was being coordinated under the newly created UNHCR, the discourse in Britain did not centre around the Hungarians’ rights under the 1951 Convention. The language used by the press, the government and reception workers was not one of obligation under international law, but rather of welcome based on an understanding of the refugees as anti-Soviet and vulnerable. Despite approximately two thirds of Hungarian refugees being young men, it was ‘bewildered’, ‘small’ or ‘sick’ women, children and the elderly who were most often depicted. This narrative of the welcoming of vulnerable or deserving refugees from Communism was reinforced by the ways in which the British constructed their own role in the process. For every mention of how these ‘welcome guests’ were ‘heroic freedom fighters’, there was another situating Britain as a moral leader on the international stage rescuing the Hungarians as part of its ‘tradition’ of welcoming ‘fighters for liberty’. First-hand accounts from Women’s Voluntary Service (WVS) volunteers universally depicted them as ‘cheerful’ and ‘stalwart’, ever ‘working tirelessly’ and ‘creating order out of chaos’ while ‘taking things in their stride’. Where there were ‘difficulties’, they were brushed over. ‘Disgruntled’ refugees might sometimes have been ‘trying’, but with patience any ‘misunderstanding’ was surmounted by the redoubtable WVS worker and a cup of tea. Overall, the conventional expectation of the volunteer-refugee interaction was of beneficent giving on the part of the British and gratifying appreciation on the part of the refugees. One volunteer at the end of the process reflected how her group had received a number of letters ‘expressing grateful thanks for our help’, and how ‘women have broken down, and… men have kissed our hands’. While admitting that there were ‘a number who have shown no gratitude at all’, fortunately these were ‘in the minority’, and overall, the volunteer declared, her experience was ‘very well worthwhile’. This was not in a discourse of refugee rights under international law and within the newly constructed welfare state. The positioning of refugees as charitable subjects by WVS volunteers sits within what Tony Kushner has termed a habit of ‘national self-congratulation’. If the British were disposed to see themselves as cheerful dispensers of practical charity and common sense, then this was viewed as an extension of the nation’s tradition of tolerance and welcoming refugees. Newspaper accounts, statements in the House of Commons and the comments of voluntary organisations and individuals all emphasised British ‘tolerance’, ‘welcome’ and ‘fair play’ where the government, police force, rule of law and everyday society operated on the basis of trust and openness. Such self-congratulation was visible at all levels of the reception effort. Colonel Pennyman, who had opened one wing of his house, Ormesby Hall near Stockton-on-Tees, for refugees was thanked by the local branch of the Red Cross for ‘the laudable way in which you have so worthily upheld the tradition of British hospitality’. At the household level and nationally the advice and media coverage aimed at the Hungarians was couched in the language of ‘host’ and ‘guest’, glossing over how ‘hosts’ might be paid board and lodging at standard National Assistance Board rates. Beneath expressions of welcome we can see certain processes at work which located the position of both Britain as the host nation and the new arrivals around discourses of behaviour rather than rights. How did this discourse of conditional welcome and the climate of high expectations translate into everyday experience in the reception and resettlement process? Overall the language of reception centred around the promotion of a spectrum of expected behaviour which began with picking up social cues and learning English and moved on to finding employment, ‘settling down happily’, and assimilating. The official report evaluating the resettlement programme placed the weight of responsibility firmly on refugees themselves: ‘It might have been expected that the Hungarians would be particularly amenable, being filled with gratitude for the help and generosity of the British people’. However, the report went on to observe how, having been feted as heroes, they ‘came to Britain expecting far too much’ and indeed exhibited a range of unattractive behaviours. For, fuelled by fears of being infiltrated by Hungarian government spies, many hostels operated with an atmosphere of mutual mistrust. And in sharp distinction to the enthusiasm of the British volunteers, often the refugees ‘would not help with the running of the camp, even for their own benefit’ unless they were paid. Within weeks of the first Hungarians being housed stories circulated in newspapers and hostel managers’ reports of bad behaviour normally involving young men, drunkenness, theft of bicycles and motor bikes, fights and downing tools at work. Chiming with contemporary anxieties over juvenile delinquents and youth culture, the ‘romantic heroes’ and ‘indomitable giants’ were rapidly transformed in the press into ‘loud mouthed ruffians, a bunch of lazy, grabbing, Central European teddy boys’. Colonel Pennyman soon found that the families he had welcomed were ‘difficult’ rather than ‘heroes’. His accounts record the ‘plain thievery’ of fifty blankets, an ‘extravagant’ use of gas, the loss of fifty teacups and of over £16 worth of cutlery. Possibly more damningly as far as he was concerned, the refugees he was housing were not interested in finding work, learning English, or ‘settling down’. Instead, they wanted to re-emigrate to the US, Australia, or South Africa where they already had relatives. We can locate Ormesby Hall’s experience as a microcosm of a far larger phenomenon. British public opinion was ‘surprised and disappointed’ to find that most of the Hungarian refugees ‘who had been welcomed with so much love’ did not wish to stay in Britain. As early as December 1956 it became clear that many of the first batch of Hungarians had thought that Britain was simply a step on the way to emigration to America or Canada. Often identified as ‘restlessness’ by those working with them, the legitimate desire of the refugees to join the large Hungarian communities in North America was typically interpreted as a slight to the generosity of the British government and people. One WVS volunteer reported that she found the refugees ‘on the whole very impatient’, expecting all ‘their requests to be granted at once’, including the desire to be transferred to America. East Riding’s County Welfare Officer spoke for many when he admitted that he was looking forward to their departure, reflecting how ‘my experience so far has rather hardened my heart a little’. A problem with constructing a discourse of refugee reception around enthusiastic welcome rather than around rights was, therefore, how to deal with a rejection of that welcome. Public enthusiasm and voluntary effort could only be sustained within an atmosphere of gratitude, and without it the welcome easily turned sour. For those sent to live in the hostel at Haverton Hill in County Durham gained this sourness was expressed through a full-scale riot in June 1957 which saw serious and sustained disturbances over a succession of nights. Hostel residents armed with fence posts – ‘some bearing four inch nails’ – defended themselves against crowds of up to three hundred locals who had surrounded the hostel. The events were sparked by anti-social behaviour on the part of the Hungarians but also by fears of locals that ‘their’ women were socialising with them, and ‘their’ jobs were being taken by them. The reality is that refugees, however feted in the media, are always simply human beings trying to reconstruct their lives against overwhelming odds. The realistic chances of them immediately understanding the social rules of the country where they find refuge, of quietly settling down and assimilating, and never transgressing their new society’s boundaries are vanishingly small. As one WVS volunteer reflected: ‘When we began this work, we prepared to receive twenty thousand heroes, but we soon discovered that we had to deal with ordinary human beings, made up of all types, good, bad and indifferent’. To deal with the awkward fact that refugees are not heroes or villains but are simply human beings, we consequently need to protect them from the enthusiastic generosity of the public just as much as from its untrammelled hatred. Simon Behrman in particular has argued that enshrining refugee rights in international law is not without its dangers, not least through entangling asylum seekers in labyrinthine and hostile bureaucracies. But relying on the vagaries of public sympathy is, I would argue, far more dangerous. Being generous feels nice, it makes us believe that we are good human beings, but true generosity implies giving with no expectation of return. Charity however, remains all too often steeped in assumptions over the appropriate behaviour of the recipient. This can be no basis on which to build the well-being, safety and futures of hundreds of thousands of people. People in need of protection, shelter and a new country should have access to this as a right, not because they smile. If we can take anything from history to inform the present refugee crisis it is to demonstrate the urgency of constructing a clear international structure of rights based on need rather than the short-term memories and shifting whims of a capricious public. Dr Becky Taylor is Reader in Modern History at the University of East Anglia.